These are reissues from three Decca LPs of the 1960s and 70s and a Philips LP from 1961. Decca recordings were famed in their day for the quality of sound, obtained by their Vienna based recording team in particular. This reissue has captured the clarity and space of those recordings very well. A reminder that fifty years ago they got stereo right. The Philips team were good, too, and the I Musici items also sound very clean if more upfront. The performances are beyond criticism except maybe in one respect, the use of modern instruments. Much of this material would sound even finer done by a period band. 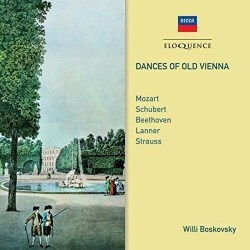 Boskovsky and his fellow Vienna Philharmonic players grouped and regrouped under these two names to record such famous series as the complete Mozart Dances, Divertimenti and Serenades. They also indulged the record-buying fraternity with epic quantities of Viennese dances from the famous, like Beethoven and Johann Strauss II, to the lesser known like Lanner. These two CDs contain about two hours of such materials, the second disc being filled out with some of Schubert's light music performed by one of Boskovsky's many competitors, the famous I Musici string ensemble from Rome. I Musici made many of the earliest recordings of the Italian Baroque composers, as well as much of the classical mainstream and some modern music. Originally the Schubert was coupled with Mendelssohn's 9th String Symphony, not included here. I Musici were under contract to Decca's competitor Philips. The world has moved on and both are now under the same roof, Universal Classics. With this fare the only question needing to be answered is, "Is it enjoyable?" Yes, it is. If you want the highest possible quality of background music, this is it. If you occasionally pay it some attention, most of it is quite marvellously crafted and full of good tunes. That summary comment is less true of CD2, which contains three more extended pieces for violin and strings, two by Beethoven and one by Schubert, surrounded by more cheery dances. Beethoven's dances are all tuneful and unmistakably his, with strength rather than grace. Some contain themes found elsewhere in his output, most famously the Eroica theme used in both the 3rd Symphony and his Op.35 piano variations. The Romances are always seen as preparatory studies for his towering masterpiece in the genre, the Violin Concerto, written several years later. They come as a bit of a shock after the string of dances which precedes them, because they altogether more soulful. Schubert's contributions are predictably tuneful, though the dances sometimes seem somewhat heavy as a result of the Italians’ forceful playing and the more closely miked recording. Felix Ayo approaches the Rondo with a little more of the 'Palm Court' than might be expected, reminding one once again that 'historically informed' these performances are not.